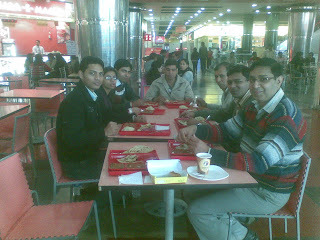 Joy - n - Freedom: Rcoket Singh - A good story from Director of "CHAK DE INDIA"
Rcoket Singh - A good story from Director of "CHAK DE INDIA"
On Tuesday Dec 15th,2009, all seven team members of GVC-NOIDA went for a morning show for Rocket Singh - Salesman of the year at Spice Mall, Noida and then a quick lunch at food court. Rocket Singh is a movie based on IT office and performance of average people with ordinary skills and creating extraordinary results. We choose Rocket Singh for various reasons including the fact that it was from the director of CHAK DE INDIA and it conveyed that doing sales is not a rocket science.